The U.S. isn’t the only place where government threatens to roll back access to healthcare. Sociomedical Sciences student Pablo Valente writes about a similar move in his native Brazil. The constitutional change has been celebrated by President Michel Temer as one of the most important accomplishments of his administration. If implemented, the funding cuts will impact millions of Brazilians who rely on its Unified National Health System. As investments drop, barriers to the already limited right to health in Brazil are expected to increase, impairing the control of health threats such as Dengue fever, Zika virus, HIV/AIDS, and restricting access to preventive services. Being a native born Brazilian and having worked for five years in its national health system, I have witnessed the current scarcity of resources there. It does not take much to realize that the challenges can only worsen with the additional limit in public spending. I pursued a career in public health because I believe in the potential of the country’s national health system, and it is with sorrow, yet not surprise, that I once again see the old argument that social rights are incompatible with economic prosperity used to justify the dismantlement of public services. Temer took office in April promising to push for “austerity measures” to control the economic recession. But these changes with the Death Amendment—called “the mother of all austerity plans” by the Washington Post—threaten Brazil’s national health system and will bring dangerous consequences to the Brazilian people. According to a report by the Brazilian government’s Institute of Applied Economic Research, had this amendment been passed 13 years ago, expenditures in health over the intervening years would have been reduced by more than $73 billion. This is a lot considering the public health budget in 2016 was less than $30 billion. The future is even more alarming: In 20 years, the health expenditure per capita could end up being half of what it would be under the current legislation. Ironically, the cuts in health spending will grow even as the country’s economy recovers. Supporters of the bill argue that Brazil’s debt has gotten out of control and there must be a cap to public spending. But the country’s public health expenditure is already a fraction of what countries with universal healthcare spend and lower than its South American neighbors that do not provide universal coverage, like Argentina and Chile. It is important to note that President Temer was not elected by the Brazilian people. He managed to oust elected president Dilma Rousseff through parliamentary maneuvers that have been denounced as a coup d'état by organizations in Brazil and worldwide. Not only have thousands of people rallied in Brazil against this process, several international media outlets, Latin American chiefs of State, 40 American members of Congress, among others, called for democracy in Brazil as Rousseff’s impeachment process unfolded. What’s more, the consequences of the Death Amendment may not be limited to Brazil. The country accounts for approximately half of the population and GDP of South America and exerts significant geopolitical influence in the subcontinent. 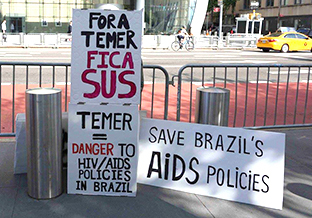 This movement away from the understanding of health as a right in Brazil, associated to the recent shift to the right in other countries in South America­ and here in the United States, may prove decisive in efforts to disorganize social safety nets across the region. The consequences will be felt harshest by the poorest and most vulnerable, and social disparities are expected to increase. The dire situation in Brazil illustrates the dynamic nature of the struggle for social rights. In 1988, after 21 years of military dictatorship and inspired by great social mobilization, Brazil established health as a right in its constitution. Brazil’s National Health System then became the largest universal healthcare system in the world. Fast forward 30 years and an unelected government threatens to undermine it despite the opposition of the majority of the population. Brazilians have taken to the streets in opposition to the expenditure caps, despite being bitterly repressed by the illegitimate government. We know that this legislation represents an obstacle to having quality public health and education. We also know that if we do not voice our opposition, this will be just the beginning of a series of unpopular austerity measures that will once again make the poor pay for a crisis they are not responsible for. The international community needs to pay close attention to what is happening. If human rights are a dialogue and a continuous tension between opposing views, we have to make sure our voice is heard. Public health advocates, who act on the border between science and politics, have the leverage to echo the shout for health as a human right in Brazil and repeal the Death Amendment. In New York, as in other major cities across the world, a diverse group of professors, students, artists, and activists have created the Defend Democracy in Brazil Committee. The group informs the international community about what is happening in Brazil and rallies for democracy and social rights in the country. I am part of it and invite you to check us out and learn more about it on Twitter and Facebook. Join us in defending the right to health and democracy in Brazil. Pablo Valente is a second-year MPH student in the Department of Sociomedical Sciences. He worked in Brazil’s Unified Health System as a medical doctor before moving to NYC and believes public health has an important role in reducing socioeconomic disparities.